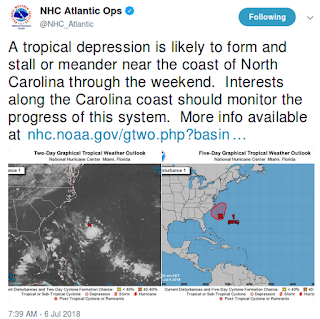 UPDATED: Immediately after posting this blog, I saw that the NHC's 8 am update had upgraded the probability of development of the area of suspicion off the South East coast to 80% (see tweet below). A reminder that, despite tremendous advances in meteorology, conditions and forecasts can change quickly. Although it is not expected to remain one for very long, overnight the NHC upgraded Tropical Storm Beryl to minimal hurricane status. The current forecast calls for it to weaken and probably dissipate four days from now. 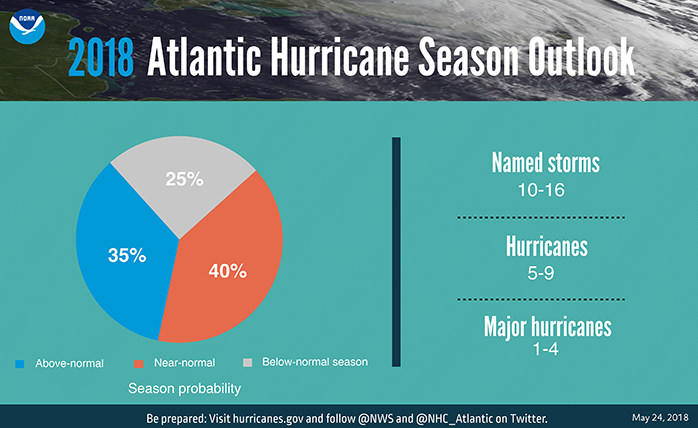 On average, we don't normally see our first named Atlantic storm until July 9th (see chart below) - so despite a very quiet month of June - we once again find ourselves slightly ahead of the curve. Despite this year's early start, and the NOAA 2018 Tropical Outlook: A Near or Above Normal Hurricane Season Expected, we have no way of knowing how many storms will impact the U.S. mainland or the islands of the Caribbean, or their severity. This week's NOAA ENSO Alert System Status calls for an El Niño Watch, giving a 50% chance of El Niño conditions developing by this fall, which typically dampens down Atlantic tropical activity. But it's only a 50/50 chance, and if it does happen, the timing could be too late to have any effect on this year's hurricane season. What we do know is as the summer progresses, and the waters of the Atlantic continue to get warmer, storms tend to form further out to sea, and have a better chance of becoming long track, major storms. 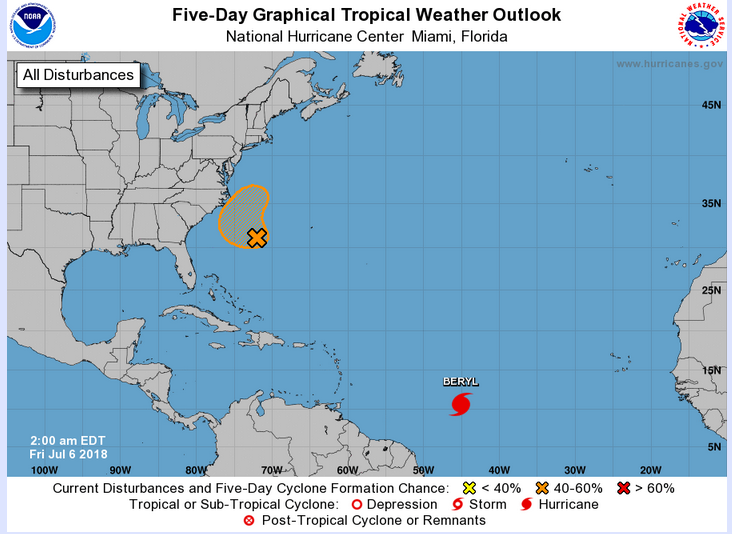 Development, however, depends on many factors, including steering currents, wind shear, dry air, and even the amount of Saharan dust aloft over the Atlantic. While the tropics generally begin to heat up in July, it is usually during August and September when the Cape Verde basin awakens and begins to produce what often turn into the largest and most persistent storms. 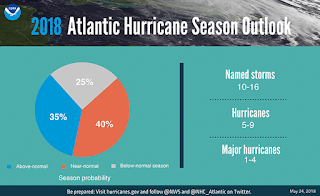 Every year I give hurricane preparedness a prominent place in this blog because I grew up in hurricane country, live there now, and have more than a passing acquaintance with these storms. For more than 50 million Americans living in coastal areas, hurricanes and their byproducts (flooding, tornadoes, lightning) are probably their greatest natural disaster threat. While South Florida and the northern Gulf coast are at highest risk of direct hurricane impact, even those areas not shaded in – even hundreds of miles inland – can still feel the effects of a hurricanes. So, if you haven't already done so, now is a good time to pay a visit to NOAA's Weather-Ready Nation Hurricane Preparedness Week web page, and decide what you need to do now to keep you, your family, and your property safe during the coming tropical season. If you are on Twitter, I highly recommend following @FEMA, @NHC_Atlantic, @NHC_Pacific and @ReadyGov.